At the heart of Wolfgang Tillmans' work is a challenge to existing hierarchies of beauty and value; he invites the viewer to discard all assumptions about where these qualities are to be found. This is not to say Tillmans seeks to expose beauty in squalor or the everyday; he also finds it in the sublime, in nature, or the aesthetic thrill of saturated colour. As the title he gave his recent Tate exhibition asserts, "if one thing matters, everything matters", and here Tillmans shows us pure gold, pure colour, balled socks, and a pub urinal as deserving of equal attention. Tillmans' installations juxtapose new images with others drawn from the span of his career, combined in varying sizes and formats, (c-prints, inkjets, snapshots, and occasionally magazine pages) framed and unframed. By showing photographs unframed, he draws attention to their existence as images, objects, and paper; these installations emphasize that Tillmans' work is not only made by the eye of the photographer and the photographer's perceptions, as we usually think of photography, but also by the hand of the photographer. For Tillmans, the hanging process is vital-it allows his entire body of work to be continually seen anew, as different relationships between works are established, and new themes revealed. He embraces landscape, portraiture, protests, nightlife and still lifes, but he does not simply photograph anything before his lens. His images pursue consistent and ongoing preoccupations. Each Tillmans exhibition has a shift of center. This particular exhibition revolves around abstraction. As a result, figurative and pictorial works, both new and previously known, are potentially altered as seen through this filter. Every time one sees a Tillmans image, the focus is shifted by context, just as memories are altered by new experiences. With this exhibition, Tillmans creates a dialogue between images which are actually abstract and those images which appear abstract in their current context. Tillmans photographs gold bars such that these precious objects are rendered thick heaping rectangles of vibrant yellow gold. They are at once identifiable as gold while appearing to be complex geometric patterns. 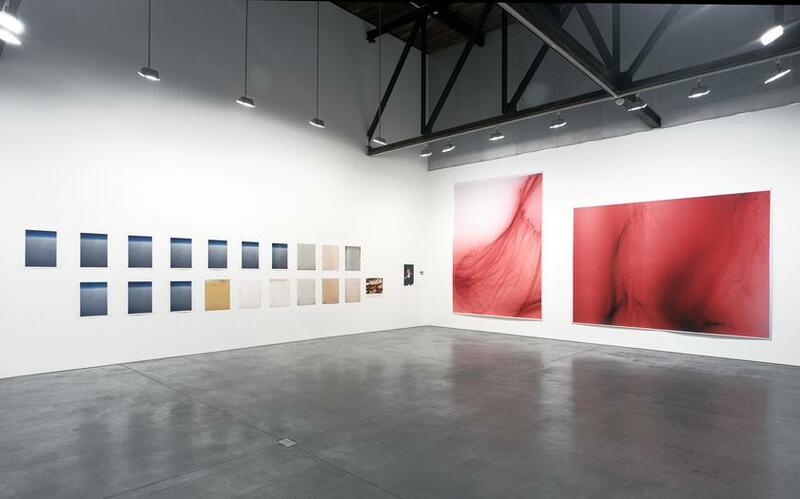 Pure abstractions, such as the two huge "Blushes" whose cascading streams of magenta dominate the gallery, refine photographic practice to the barest elements of light on paper. Made without a camera, lens, or negative, they transform the photograph into a unique object, an idea also pursued in the "arctic/silver" series. While suggesting serial reproduction, each arctic view is differentiated by the slightest of darkroom interventions in the form of fleeting dark dashes. The accompanying monochromes, chance creations from the residue of darkroom chemicals, epitomize Tillmans' ability to find aesthetic potential in the unexpected. As all photographs capture light's impact on paper, for Tillmans, abstract and figurative photographs share an essential core. What is begun with figurative photographs, his abstractions distill, bringing the malleability of photographic objecthood to the forefront of every piece. The individual strength of images is challenged and enhanced by their presentation, fluidly interweaving the figurative and abstract. ,i>Tate Britain's extensive mid-career retrospective of Wolfgang Tillmans' work, shown this summer, was the first time the museum had devoted an exhibition to the work of a single photographer. It followed a major touring European museum exhibition, "View from Above", which visited Hamburg, Turin, Paris, and Louisiana, Denmark, over 2001/2002. Tillmans was awarded the prestigious Turner Prize in 2000. Born in Remscheid, Germany, in 1968, Wolfgang Tillmans has lived and worked chiefly in London since 1992.